Oil India Limited invites applications from eligible candidates from its transportation areas in the districts of Jorhat, Golaghat, Kaliabor, Morigaon, Nagon, Nalbari, Kamrup(M), Bongaigaon, Kokrajhar of Assam, Jalpaiguri, Darjeeling, Uttar Dinajpur of West Bengal, Katihar, Begusarai, Khagaria of Bihar for recruitment of undermentioned post. a) Passed class 10th or equivalent from Government Recognized Board. b) Passed 3 years Diploma in Civil Engineering discipline from Government Recognized institute/ University. PWD/Ex-servicemen: As per Government of India directives. a) Only those candidates, who fulfill the eligibility criteria mentioned in this notification as on 31-12-2017 will be called for Written Test (Stage-I). The question paper for Written Test (Stage-I) will consist of 3 (three) sections viz. (A) English Language with General Knowledge/Awareness with some questions on Oil India Limited; (B) Reasoning, Arithmetic/Numerical as well as Mental Ability and (C) Relevant Technical Knowledge in the course curriculum depending on the post. b) Those who obtain minimum 50% (fifty percent) marks in the written test (Stage-1) will qualify for Computer Operation Skill Test (Stage-II). Computer Operation Skill Test (Stage-II) will be of a qualifying nature where the qualifying marks is minimum 50% (fifty percent). Computer Operation Skill Test (Stage-II) does not carry any weightage in the final selection. Only those candidates who will secure the qualifying marks of minimum 50% (fifty percent) in the Computer Operation Skill Test (Stage-II) will be considered in the merit list for final selection. Other candidate(s) who do not secure the qualifying marks of minimum 50% (fifty percent) in Computer Operation Skill Test (Stage-II) will not be considered for final selection. Final Selection will be made in order of merit on the basis of the marks obtained in the Written Test (Stage-I) only. How to Apply: Candidates must ensure that all the details provided by the candidates in the prescribed Application Form tally with the respective attached documents/certificates/testimonials. Any mismatch in declaration with the enclosed documents/certificates/testimonials shall lead to disqualification of the application. The Envelope Containing The Application Should Be Superscribed With 'Post Code'. Applications Should Be Sent To The Dy. General Manager (ER) PL. Pipeline Headquarters, Oil India Limited, P.O. 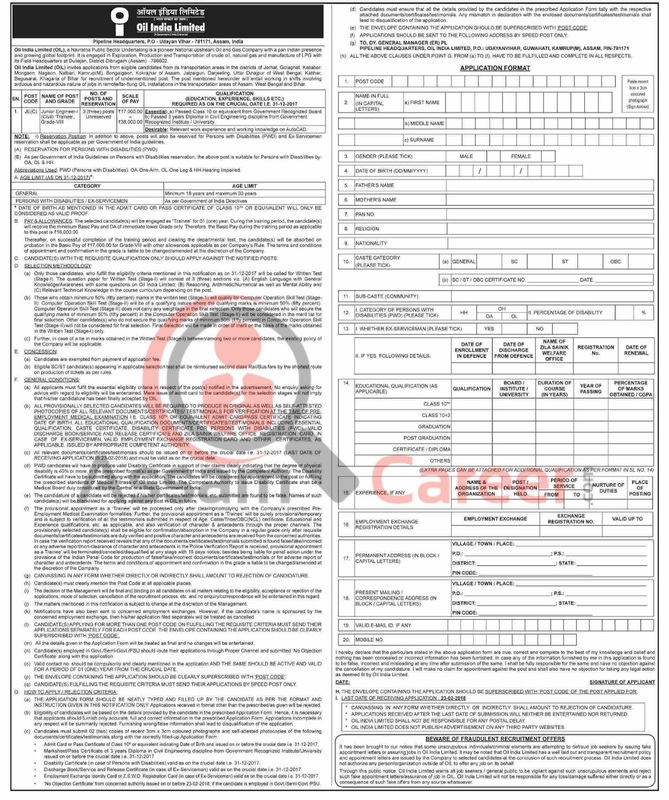 : Udayanvihar, Guwahati, Kamrup(M),Assam, Pin-781171 By Speed Post Only on or before 23/02/2018.